Instant Pots have always been thought of as the kitchen gadgets that do it all, but there’s one popular feature that no Instant Pot has ever had: sous vide cooking. Sure you can slow cook, sear, saute, bake, and more, but home cooks looking for a good sous vide machine had to look elsewhere… until now. Most people don’t even realize it, but Instant Pot now makes a multi-use cooker with built-in sous video immersion cooking functionality. 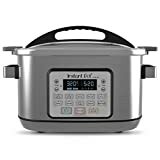 It’s called the Instant Pot 8 Qt Aura Pro Multi-Use Programmable Multicooker with Sous Vide, and it’s available right now on Amazon!